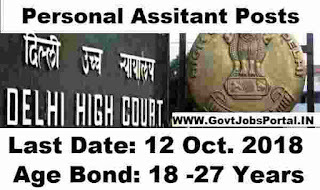 Delhi High Court recruitment department issued an official notification on the official website in which they are inviting all Indian candidates to apply for these Government jobs in Delhi High Court. There are total 35 vacancies which are going to be fill up through this High Court recruitment process 2018. Those who are interested in these Government jobs in High court have to apply online through the official website of Delhi high court. Below in this article we share the complete detail related to the eligibility criteria ss well as the link for applying online. So we advise all applicants to read the whole article carefully before applying online for this High Court recruitment 2018. Those who have a Graduation degree in any stream can apply. Must have good skill in English shorthand 100 WPM & Typing speed 40 WPM. 22ND Sept. 2018 is the Opening Date. 12th Oct. 2018 is the Last Date to Apply. 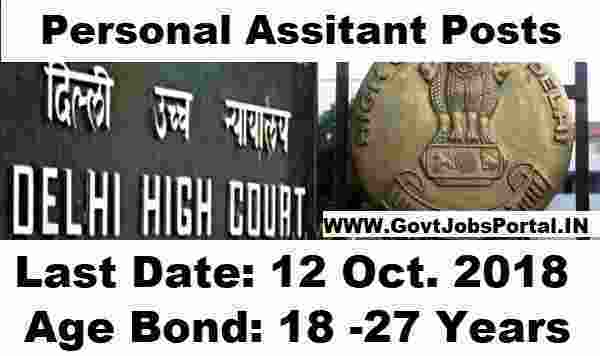 Those who satisfied all the eligibility conditions related to this high court recruitment 2018 have to apply online through the official website only. We share the official notice which was shared on the official website that candidates have to apply online on to the following website https://applycareer.co.in/dhc/pa2018/. There is no other process for applying this high court recruitment process. The process for applying online will be activated on 22nd Sept. 2018 and will remain activated up to 12th Oct. 2018.